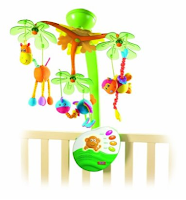 ... a mobile with a remote control, like the Tiny Love Sweet Island Dreams Mobile. It took us awhile to get BB to sleep in his crib. And we tried a lot of products during our efforts. One thing we noticed early on was that he'd sleep in his crib while his mobile was moving or playing music, but once it stopped, he'd wake up. This mobile, with a remote control, saved us. Instead of going into his room to wind his mobile, all we had to do was stand in the hallway and push a button. It was less disruptive and was definitely one of the reasons BB started liking his crib.